After a day or two of nail-biting, monitoring forecasts of sky conditions, the Clear Sky Clock tipped the scales for me… Wednesday night's sky would be clear and we would be able to see the Feb. 20 total lunar eclipse. I packed up only one extra eyepiece –the great antique scope has a wonderful low-power ocular that presents the entire lunar disk– and bundled myself up. It was a c-o-l-d night! As the eclipse was getting underway a freshly-cleared sky began to cloud up. A thin layer of cloudiness obscured all detail from the Moon just as Earth's shadow was taking a good chunk out. And a little snow fell through the dome slit! Gad! Just as I was beginning to give up hope, however, the sky quickly cleared and we had good seeing for the rest of the night! The view of the Moon through the 9-inch refractor was typically spectacular. Even the full Moon looks great through that scope with its fist-sized eyepiece. During the partial phase of the eclipse, however, there was a time when the lunar limb was relatively bright, the central portion of the disk was bluish, and the dark shadowed region took on a reddish hue. Quite beautiful. During totality the Moon took on a pale coppery color; it was not a particularly colorful eclipse. Impressive and beautiful, nonetheless. In all more than 44 visitors came into the observatory — there were probably more but people were coming in to look through the telescope and going out to enjoy the sky with their own eyes … they were getting into the event! The last visitors left at around 11 PM and I was finally free to try some photos. 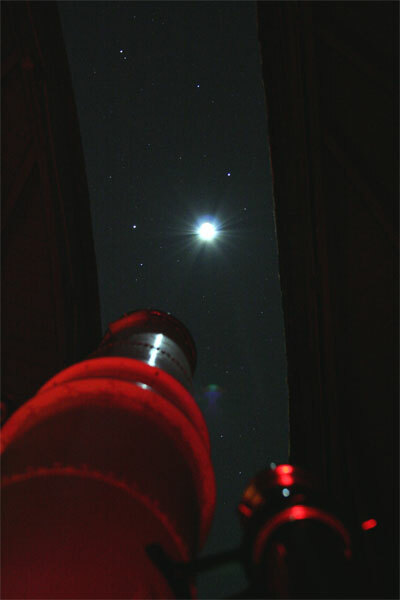 A little too late, however, to get the shot I wanted… looking at the Moon along the telescope and through the dome. The Moon had already brightened to the point that I couldn't balance the exposure. It's a nice photo anyway and I'll use it for some things, it's just not the picture I had imagined. It was getting late and my feet and hands were getting cold –it was 18 degrees F. in the dome– so I closed up and went home. A very good night of eclipse watching. Wow! That is a great photo even if it is not the one you envisioned. Our sky cleared enough to watch it through wispy cloud – like S we watched it from a window in a warm room. I imagine it was lovely through a telescope.